“Den and Sandra Esqulant have run The Golden Heart for seven years. 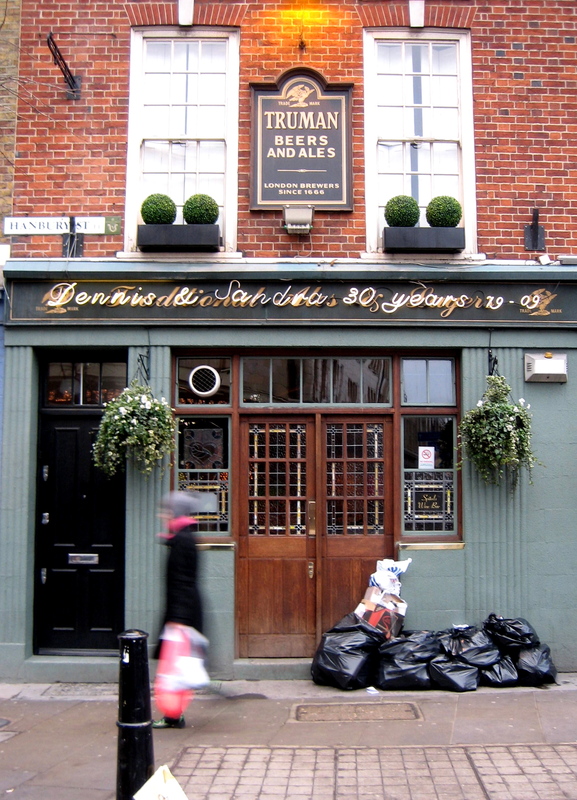 During that time Spitalfields has changed quite a bit and the pub has altered accordingly. Out went the public bar with its pool table, dart board and large colour TV. In came the Spitals Wine Bar with waitress service, a “very high standard of food, good wine” (no bottles of Hirondelle suspended over fibre optics here), and a wicker fan from the Kings Rd. They were the first to open a wine bar in Spitalfields and the first to serve a Beaujolais Nouveau breakfast last November – an event covered by the local press. The Golden Heart is a chameleon-like pub with its character changing with each session. It opens at six in the morning and is soon full of bustling market men and Spanish lorry drivers, who apparently prefer coffee to beer. A typical market pub in fact. Lunchtime sees the pub filling up with chartered accountants and in the evening the pub is used mainly by local residents. So it could be a metaphor for the whole of Spitalfields – that is if you’ve drunk enough Beaujolais Nouveau and are feeling suitably pretentious. When I met Mike Myers, the Spitalfields crooner, who edited the “Spitalfields News” for two years in the eighties, we searched in vain through his personal archive to find this article. Mike thought he probably gave his only copy to Sandra in 1986, but thanks to the Local History Collection at the Bancroft Library you can read it today. Once I opened the copy of “Spitalfields News,” there was Sandra prominent on page three. 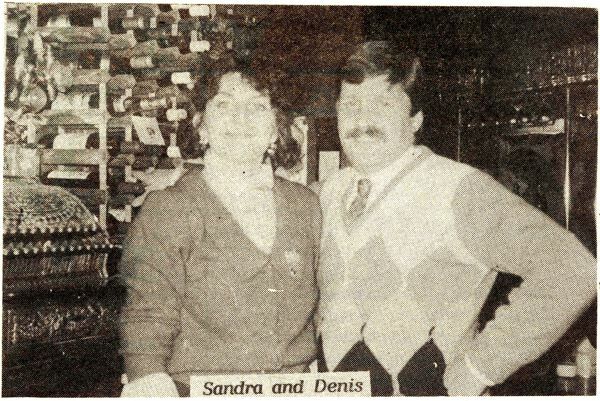 Although the picture is feint and grainy, there is no doubt Dennis and Sandra make a happy couple and I think Sandra looks pretty good, fashion-forward in an eighties mode with her Princess Diana style ruffle collar. Not yet the Queen of Spitalfields we know today, but already a princess in waiting. She seems to have shown Mike a little bit of attitude when he went to interview her early in 1986, but we all mellow with time, and neither she nor Mike knew that he would become a regular, still coming back for a pint a quarter of a century later. Reading the feature now, I am struck by the novelty of European things. The United Kingdom joined the European Union in 1973 and wine bars were all the rage throughout the eighties as drinking wine became a more sophisticated alternative to an honest pint. No doubt Sandra is relieved not to open at six in the morning anymore, though she still retains an early licence. We shall not grieve for the flock wallpaper either. The French signs on the toilet doors remain, as does the “real” gas fire where Sandra’s dog Molly sleeps most nights, and The Golden Heart does feel like a private home. Back then, people were already talking about Spitalfields “changing quite a bit” just as they do today, though regrettable prostitution is still part of our neighbourhood. Yesterday, I dropped into The Golden Heart around five o’ clock when Sandra was busy serving pints to the thirsty office workers. Once there was an opportunity, I handed her a photocopy of the story, unfolding it onto the counter and, amid the clamour of the Public Bar, she read it through to herself with her hand upon her cheek in quiet concentration. Sandra remembered the moment when the picture was taken and placed her fingers affectionately upon the image of Dennis,who died last year, “He never changed” she said, “I still have that sweater, I always bought him intarsia cashmere sweaters from Ballantynes.” I asked Sandra about her old French surname, mentioned in the article, and she confirmed that she understands Esquilant is of Huguenot origin. I think it was a cushy job Mike had going round writing pub profiles and now that most of the ones he wrote about have closed it has become an important social record. Maybe I can follow his example, writing pub profiles for “Spitalfields Life”? There are plenty of bars left in the neighbourhood for me to work my way around. Ah Sandra, I feel in love with Sandra one Sunday, as she was removing a drunkard from the premises. I agree, lovely boozer. Smallest Gents in the world though. Anyone remember the Cakebread family they run The Golden Heart in the 1800′s.My Great Gran was Alice Cakebread. Rebecca from Somerset.